It sounds like the type of thing you’d see in a science fiction movie. But it could be coming to the US in the near future. It’s hair cloning and some researchers believe that it can be pivotal in the battle against hair loss and thinning hair. At RHRLI, we offer a state-of-the-art permanent solution to hair loss right now. It’s called the ARTAS® system and it uses robotic technology to give you a healthier head of hair. We help our patients every day with this life-changing hair transplant procedure. We want our patients to know about the latest research and trends in preventing hair loss, so we want to share where we’re at in the area of hair cloning. The idea behind hair cloning is to take healthy follicle cells from areas where there is no hair loss and then multiply them and use them for future hair transplants, according to Wikipedia. That’s similar to what happens during a transplant using the ARTAS® system. At RHRLI, your doctor uses a robotic arm to find healthy donor hairs and transfer them to where they’re needed. Using this robotic arm makes ARTAS® the most precise procedure available. But some patients may not have enough healthy donor hairs, and that’s the reason why hair cloning would be such a breakthrough in the area of hair loss treatment. Currently, hair cloning is not available in the United States but some clinical trials are being done, according to KXAS-TV in Dallas-Fort Worth. According to Dr. Kenneth Williams Jr, a California hair restoration surgeon, patients without donor hairs are good candidates for trials. “The typical candidate would be someone who has had multiple surgeries and can’t have any more hair transplantations, but they do have lots of areas of balding,” Williams told KXAS. The way the procedure works is that doctors harvest about 50 hair follicles and then send them to a cryopreservation tank belonging to a British company Williams is working with. Surgeons in England then remove the hair shaft from the bulb, which holds cells that control growth and those cells are multiplied, according to Williams, who says that this has the potential to multiply the 50 cells that were removed into 1,500 brand new cells. The British company is hoping to start the trial soon. Ric Ortega, one of Williams’ patients, has health concerns related to his hair loss. “I’m outside a lot because I work in the construction industry, and I worry about skin cancer on the top of my head,” he told the TV station. 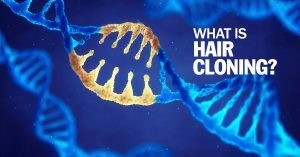 There are concerns about the treatment, according to KABC, The US Food and Drug Administration has to approve hair cloning for safety and there are concerns that the procedure may induce tumors. If hair cloning is found to be safe by our government, it could prove to be a valuable tool for combatting hair loss. In the meantime, RHRLI is the only treatment center on Long Island with the ARTAS® system. To learn more, contact RHRLI today. Previous Post: « How Much Hair Loss Is Normal?